There seems to be a bit of confusion recently when it comes to the BMW G310GS’ India launch and we’re here to dispel these rumors. Originally, BMW Motorrad did confirm the G310GS launch date on twitter last year, with initial release expected to take place late 2017. But when RushLane reader Sahil Husain got in touch with BMW Motorrad India for a second confirmation, he was told that BMW had no plans to launch the G310R’s adventure sibling in India. An odd reply seeing as the G310GS will be produced at TVS’ Hosur plant alongside the G310R. A first for BMW thanks to a technology co-operation agreement the German company made with TVS. 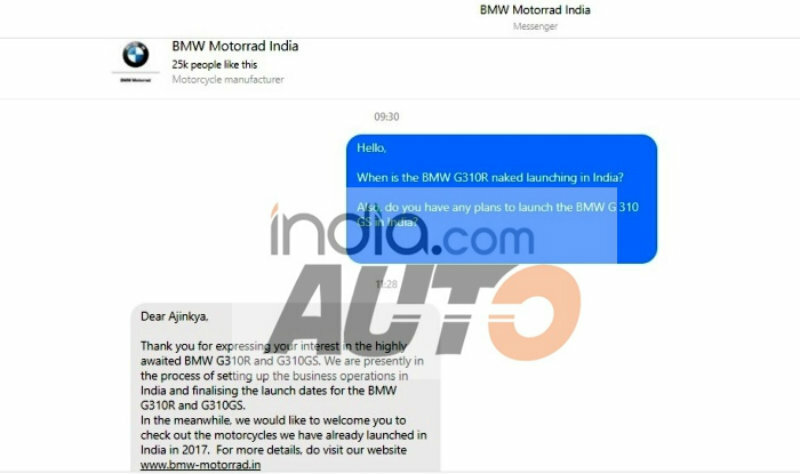 Not one to simply take media speculations as fact, India.com contacted BMW Motorrad India regarding this matter and was told both the G310R and G310GS will be launched in India. Currently, BMW’s India branch is setting up dealerships and service centers across India to increase brand accessibility. “We are presently in the process of setting up the business operations in India and finalising the launch dates for the BMW G310R and G310GS”, said BMW Motorrad. This statement is also supported by the president of BMW India, Vikram Pawah, who suggested that the G310R’s India launch has been delayed until next year. So those of you in India will still have a chance to get your hands on either one of BMW’s 313 cc single-cylinder powered bikes. It’s just a matter of time now. We really can't take either social media reps seriously because they both say something different and the BMW Motorrad India account is most likely shared between various employees. They've either been given different information from the higher ups for whatever reason or one of them remembered the wrong info. It’s April of 2018 and g310r Ian yet to Ben launched. If any of you have any information regarding the launch date by any means please reply. Been waiting for a long time. Thanks. As for latest updates for this, BMW has started accepting bookings for both R and GS in India from June 8th 2018. The bikes are expect to be delivered to customers by first week of August. Prices are yet to be disclosed by BMW india. Very strange that India has to wait so much longer than the rest of the world and ...... the bike is produced in India ?????? There are only handful of dealers for BMW in India, Till date all the bikes of BMW were sold through the existing 4-wheeler dealers across India. Now as the BMW Motorrad has stepped up and open few dealerships across major cities since past few years it makes sense to launch 310's now. Still the network is very small compared with all other competitors and thus might not be able to cope up with the demand and hype these bikes have already created. Hoping a good sales and service experience from the Germans in India. Awaiting for the test ride in last week of July and delivery might start from August 2nd week. Keen on test ride as I was disappointed with small KTM's sold in India, the Duke 200 and 390. That's odd... I thought India had the bike for over a year now and USA was last to get. The reason I say this is that ALL of the YouTube videos on 310R and GS last year came from India (or maybe Pakistan, Indonesia?) Not one from USA. Seemed like everybody and their brother over there was doing a review and comparison. Maybe they were built from dumpster divers getting parts from behind factory. Just kidding.